There are certain periods in history that seem to get all the attention. The pioneer experience. The Civil War. World War II. I’ve always enjoyed the less exposed parts of history more. My “preferred” war is World War 1, and the quantity of material centered around it pales in comparison to WWII. Though I know there are many, many great stories about WWII, I’m rarely drawn to them. However, I’ve read two WWII books in recent months that I adored. Of course, both of them concern less visible parts of that well known story. Because I’m friends with some of the organizers at the North Texas Teen Book Festival, I got roped into moderating two sessions. One featured history. Ruta Sepetys is an author that has been on my to-read list for quite some time, but knowing that she was a featured speaker at the luncheon as well as a likely candidate to be on my panel, pushed her to the top. I was able to get her most recent book, Salt to the Sea, on audio and listened to it during a long drive to Corpus Christi. All I really knew going in was that it was about the largest maritime disaster in history, the sinking of the Wilhelm Gusltoff. It follows 4 young adults, struggling to outrun the advancing Russian army. The Wilhelm Gustloff offers a promise of freedom and a new life. It’s a gripping, intense novel, and I had to think carefully about when to listen to it during my drive. For the record: listening to the final chapters while heading north on I-35 in Sunday afternoon traffic is not recommended. This afternoon, I finished an older novel, Esther Hautzig’s The Endless Steppe, about her family’s exile to Siberia during WWII. Though the story of them suddenly being rounded up and piled into cattle cars was very familiar, the story of exile in Siberia was very different. When they were finally allowed to go back to Poland, Esther didn’t want to go–she had made a home in Siberia. And of course, home was now very different–almost their entire family that had stayed in Poland had died in concentration camps. One of my questions for Ruta was about the piles of research that was necessary to write a book such as Salt to the Sea. Her answer surprised me: she wrote as she researched. She was able to interview some survivors, and the story unfolded as she researched. I am baffled and amazed that she is able to do this. Esther wrote her book based on her own memories, but published more than 20 years after the war. One of my favorite tidbits in the book comes in the afterward. . . The important thing about books such as these is they help make the hidden visible. You can’t tell every story in a classroom or a museum. But a book for every story? That, perhaps, we can do. In the fall of 2011, my family and I made our first trip to Hawaii. In what should be no surprise, we made sure to make time for a visit to Pearl Harbor. My knowledge of World War II is probably deeper that the average bear, but I’m not even close to being an expert. Before visiting Pearl Harbor, I had never really considered the impact of that attack on civilian life in Hawaii. Their exhibit spaces made that abundantly clear, and I found myself thinking deeply about all that had to happen after the attack. And of course, the USS Arizona Memorial was incredibly moving, even though it was also incredibly crowded. Like any good museum professional/tourist, we made a lengthy stop in the museum store. While there, I picked up this little book. I’m not asking for recognition for myself. But some of these boys never made it home. Do you see? There should be a place where their families can go to find these portraits. There should be a way for people to see what we sacrificed in that war, a whole generation of men lost. I didn’t paint anything else those four years. I put all my energy into this. Four or five sketches a day, and then I’d have to stop. Your eyes can only take so much. This was the most important work of my life. World War II is such a big story–just go to any bookstore and see how many books about the war span the shelves, especially compared to other wars or periods in history. Is there a place for a small book of fictional stories about women on those shelves? 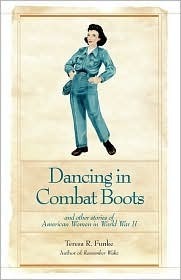 I would argue that books such as Dancing in Combat Boots give people something small enough to hold on to. Shelf after shelf of fat books about military strategy, soldiers, the European Theater, the Pacific Theater, the homefront, and politics are going to intimidate a lot of people. But by its very nature, fiction is less intimidating. And when you have a book like this, one that has good, solid historical research behind it and tells engaging stories, you’re one step closer to teaching people about the past. I’ve recently returned from a three week professional development seminar that was all about the place of history museums in the world around us. We spent hours discussing history’s role in public life and ways to increase the relevance of history. Some people argued that we have to teach the public more about the ways of doing history. There was also a subtle undertone that fluffy, feel good history was something we should abandon–we must focus on the Seriousness of History. I have always believed that you lure people in through their comfort zone, and then you push them a bit. With that pushing, they may realize they’re ready for a deeper exploration of the past. And that’s what books such as this do so well. The look of the book is utterly charming, but inside are some difficult stories about the Japanese internment, sexism in the workplace, and the fears when a POW comes home. And these stories certainly have inspired me to look again at the stories surrounding World War II. Reading someone’s diary, even when given permission, can be scary business. Can they write? Is it just going to be a bunch of gossip about people you don’t know? Do they ramble too much? There are plenty of published diaries out there, some by famous folk and some by people who happened to live in interesting times. Me being me, I’ve always been more interested by the ordinary people living in extraordinary times. How does their version of history differ from the “official” version? What details do they note that historians looking back might not have noticed? Often, as people go through their things, they toss the letters and diaries, thinking there’s nothing important in there. This makes me ache for all that we’ve lost, particularly from people that often aren’t in history books. 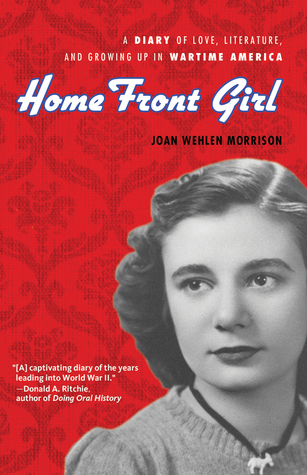 So, when I got a note offering me a review copy of Home Front Girl: A Diary of Love, Literature and Growing up in Wartime America, I was a little excited. This sounded exactly like my kind of book–and it is! Joan Wehlen, born in 1922, kept a diary from the time she was 12. Upon her death in 2010, her daughter found volumes of these notebooks, saw their value, and edited and published them. Three cheers for Susan Signe Morrison! As a historian, I’m thrilled that his diary is now widely available. In doing a quick amazon search, there don’t appear to be many American World War II diaries in print, and even fewer by women. The home front experience is a vital part of the history of any war, and we need this additional voice. Especially because it is such a young voice. Born at the end of one disastrous war and bred between two wars with always the foreknowledge of this war that is come upon us as we reach adulthood. Yes, we are a race apart. Something quite different. I do not think we would any of us for all our talking fit into another time–another century, even another decade. With her daughter’s help, she has certainly done that. As I read, I kept thinking of a fictional girl who came of age during a previous war: Rilla Blythe. I do believe these girls would have much to talk about. Both books take the smaller, but ultimately more universal, stories of life on the home front and show how war changes everyone, even those that stayed at home. I think it would be fascinating to teach the two books, hand in hand. My main quibble is one that the editor couldn’t do much about–the journals end rather abruptly in February 1942. I wanted to know more! But do read the final footnote on that entry for a satisfying conclusion to Joan’s story. This book is being marketed as young adult non-fiction, which I hope doesn’t limit its readership. Hopefully, readers with an interest in this era won’t be turned off by the young adult classification or miss the book entirely. It still amazes me how many people are ashamed at reading children’s and young adult fiction! But the age of the author certainly makes it more appealing for teens. It’s not that I don’t like historical fiction for kids. It’s just that there’s so much bad historical fiction out there–books that probably aren’t going to convert any kids to the history-nerd lifestyle. In the past couple of weeks, I’ve been doing a lot more reading than usual. Due to the bizarre combination of a miserable cold, the holidays, lots of accumulated comp time, and a week of furlough, I haven’t worked a full 8-hour day since December 18. Please don’t hate me. But this whole not going into the office thing leaves a lot of spare time for other things. Like books. So I turned to my enourmous To-Read list on Goodreads and started requesting books from the library. In the midst of the stack, I read two very different historical fiction books for children: The Green Glass Sea by Ellen Klages and The Hope Chest by Karen Schwabach. The Green Glass Sea is the story of two girls growing up during World War II. At Los Alamos, as their parents race to create the atomic bomb. The Hope Chest is the story of two girls who witness the end of the fight for women’s suffrage in Tennessee. GGS is almost a perfect book. The characters ring true and natural. It tells a complex story, but does it through Dewey and Suze’s eyes—not the all-knowing narrator who already knows exactly how this whole gadget thing works out. I learned all kinds of little details (how does a kid apply to college when his high school doesn’t exist) and bigger stories too (women in science). And at the end of the book, I wanted to know more about Dewey and Suze, but also the history of Los Alamos. Klages provides a few, selected sources at the end, which is exactly enough to keep the interest going. Almost all of my pet peeves in historical fiction happened in HC. I began it with such high hopes–an older sister has taken the money given to her for a hope chest and bought a car instead. And then she heads n orth to work for women’s suffrage. Younger sister discovers that her parents have been hiding all these letters from big sis so she runs away. And that’s where it all went down hill. Violet gets to New York and gets lost. She becomes friends with a younger African American girl (because that happened on a regular basis back then). They hop a train to DC, meet an anarchist who happens to be her sister’s boyfriend, and then head to Tennessee. Violet becomes a spy for the antis (what, they don’t notice an 11 year old hanging out?) She just happens to be involved in the final crucial voting. Every single person related to the end of the suffrage movement parades across the pages. Oh, and there’s segregation issues and anarchist stuff and well, just about every historical issue possible in 1919/1920. Seriously? It’s just all way too convenient. And doesn’t feel real at all. My biggest issue with this book, and others like it, is that it felt like a history lesson. Schwabach was doing everything she could to make sure it was a PC book that covered all the major issues. Her author’s note and references at the back is huge–she recommends a couple of books for every single historical theme, even if they were just minor in the course of the story. Schwabach was trying way too hard to teach history–rather than hinting at a few things, hoping to spark interest that kids will later follow. It’s a complex time and a complex story, but there was no grace in this book. Perhaps I’m being extra hard on this book for two reasons: I read it just after reading Green Glass Sea and this is my favorite time period. To my knowledge, there aren’t any factual errors, but I did have to suspend my disbelief on a regular basis. Unfortunately, it seems like there are a lot more books out there that are like The Hope Chest, with its heavy-handed history, than the beautiful, graceful Green Glass Sea. Which all leads me back to why I think kidlit history is so important in inspiring future history nerds. Often, you don’t even realize that you’re learning about history. It’s just a good story. There are no author notes at the back, explaining the details or historical events that might have flown right over your head. The author isn’t trying too hard to get all the details in there–because they’re writing about their own experiences. And somehow, the history just seeps in. It rings true and feels right, and you’re not wasting time questioning the historical details. And though there aren’t a list of resources for “further reading,” kids can discover more if they want to. Or, they might turn into someone like me–someone who doesn’t discover their love of history until they reach college. And in looking back realizes that it’s been there all along, in the books I read over and over again.